Bruce Allmty, under jockey Roberto Meraz, sets the new 110-yard track record in the "Blink of an Eye" allowance.at Remington Park on Sunday. OKLAHOMA CITY, OK�APRIL 22, 2018� The annual Extreme Racing Day at Remington Park features exhibition racing with exotic animals in between the American Quarter Horse racing. The special Sunday program also features race distances not usually conducted. In this case, shorter distances. The effort bested a mark held since 2012 by Jakes Charming Jody (:6.784). Owned by Adrian Cano of Wichita, Kan. and trained by Fernando Carrete, Bruce Allmty was ridden by Roberto Meraz. In setting a new track record at the quick-distance of 110 yards, The IVORY JAMES 4-year-old also won his fifth consecutive race, in a streak that started at Zia Park in Hobbs, N.M. in December 2017. 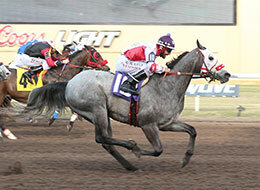 In the race prior, Ms Haulin Chic handled a $30,000-level claiming event, traveling 220 yards in :11.547. The time was quicker than the mark of Smokin Past You (:11.657) set in 2010. Owned by Haulin Assets Racing of Greenville, Texas and trained by Allen Hybsha, the 4-year-old daughter of DOMINYUN was ridden by Ismael Ricardo. Both new track records were established over a fast track.